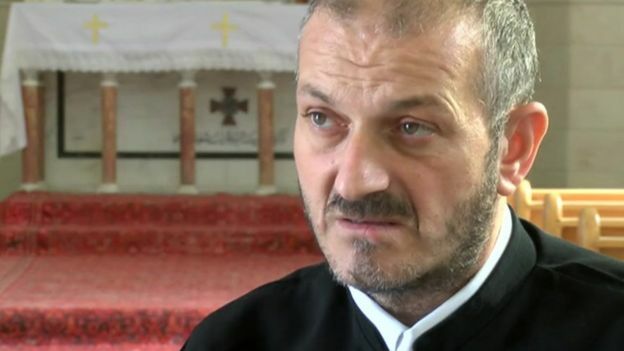 A fascinating story has emerged from Syria of the way IS chose to treat a Christian priest and his community, reported by the BBC. This is the first time Fr Jack Murad has spoken about his ordeal. He was abducted from the central Syrian town of al-Qaryatain in May along with Botros Hanna, a volunteer at the ancient Mar [Saint] Elian Monastery. Fr Jack told BBC Arabic what happened. He remembers how he and Botros Hanna were blindfolded and had their hands tied, before the car they were forced into sped away to an unknown destination “in the mountains around al-Qaryatain”. After four days, the two men were blindfolded and handcuffed again, before being forced on a much longer journey. They ended up in a cell somewhere in Raqqa, IS’s stronghold, where they were kept for 84 days. The captives were well-fed, given medical treatment and never tortured, Fr Jack explained. But what stood out, he said, was the verbal abuse. Fr Jack and Botros Hannah were repeatedly called “infidels” and told that they had strayed from the true religion of “Islam” – in particular, “Islamic State’s interpretation of Islam”. Intriguingly, though, Fr Jack says his captors all seemed curious about his Christian beliefs. “They would ask about my theology – God, the Holy Trinity, Christ, and the Crucifixion,” he said. But he thought it pointless trying to answer. Despite otherwise treating them well, the militants he met would scare prisoners, telling them they would be killed if they refused to convert. ‘For them, my fate for refusing to convert to Islam was death. To frighten us, they would even tell us in detail how we would die. They are truly gifted at using words and imagery to terrorise,” Fr Jack recalled. The priest said the experience only strengthened his faith, although at the time he expected to be beheaded. They hugged and then Fr Jack looked up to find an astonishing scene. 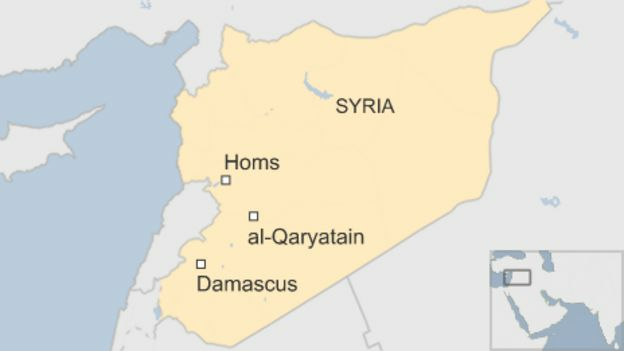 During his captivity, the town of al-Qaryatain had been captured by IS. All of them were held captive another 20 days. Finally, on the 31 August, Fr Jack was summoned before several IS clerics. They wanted to convey what IS leader Abu Bakr al-Baghdadi had decided about the fate of the Christians of al-Qaryatain. Various options were on the table, including killing the men and enslaving the women. Instead the IS leader chose to give the Christians the “right to live as citizens in territory held by Islamic State”, which meant returning their land, homes, and money in return for conditional IS protection. 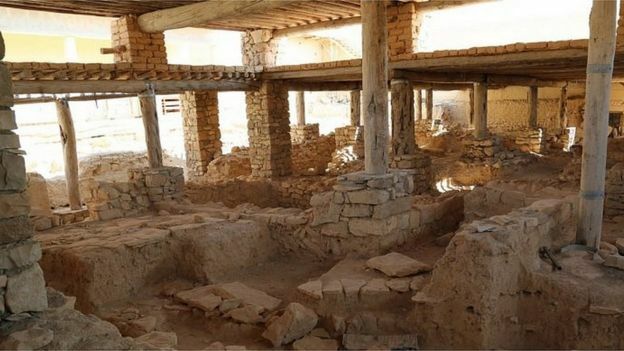 Fr Jack told them everything he was asked about the churches and the monastery in al-Qaryatain, but omitted to mention Saint Elian’s grave, hoping he could spare it from destruction. But it was difficult to fool the IS militants. During his captivity the monastery had been confiscated by IS as a spoil of war during the battle for al-Qaryatain and was destroyed. The IS clerics read out to him the terms of an agreement between the Christians of al-Qaryatain and Islamic State. Still, Fr Jack managed to leave the IS-held territory. Botros Hanna, the volunteer, also escaped with him. But not many more followed him afterwards. Fr Jack says 160 or so Christians are left in al-Qaryatain. What does this story tell us about IS? On the surface, it tells us that their reality may be more nuanced than we might assume. Or is that simply what they want us to think? Did their leadership – who appear to have an excellent grasp of publicity, especially via social media – think that sparing the Christians would receive approving coverage in the rest of the world? Perhaps. And yet their motivation for such a move is unclear. The “end times” cult that is IS positively welcomes the invasion of their Caliphate as the precursor to the Second Coming of Christ and their eventual triumph over the whole world. In short, they don’t care what we think of them, and have an agenda to provoke us. Then again, maybe IS is like all organisations, made up of different strands of opinion, and on this occasion a less belligerent faction prevailed. It is impossible to say, as we can’t ask them. And meanwhile, the slaughterhouse grinds on, and neighbouring countries struggle to deal with millions of people fleeing all the combatants, none of whom are innocent of terrible human rights abuses. The failure of the world to prevent this entirely predictable mess, and our apparent inability to resolve it, is sobering indeed.